last summer, i drove across the country from Eugene, Oregon to Chicago. Before cutting east, I left Eugene and headed south to California where I spent a few days with my aunt. She sent me on my way with two jars of jam and a box of stoneware (including the bowl that holds the brussel sprouts in my previous post). Lately I've been eating oatmeal for breakfast. 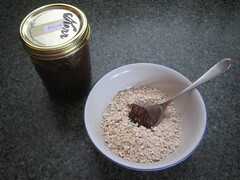 The oatmeal is unflavored, so i've been adding a spoonful of feijoa jam. feijoa is a fig-like fruit from south america (http://en.wikipedia.org/wiki/Feijoa). it's not too strong and it adds a lovely subtle sweetness to the oatmeal. it's must better than the overpowering flavors they usual put in oatmeals.